Knee osteoarthritis is one of the most common degenerative diseases causing disability in elderly patients. Osteoarthritis is an increasing problem for ageing populations, such as that in Hong Kong. It is important for guidelines to be kept up to date with the best evidence-based osteoarthritis management practices available. The aim of this study was to review the current literature and international guidelines on non-surgical treatments for knee osteoarthritis and compared these with the current guidelines in Hong Kong, which were proposed in 2005. Internationally, exercise programmes for non-surgical management of osteoarthritis have been proven effective, and a pilot programme in Hong Kong for comprehensive non-surgical knee osteoarthritis management has been successful. Long-term studies on the effectiveness of such exercise programmes are required, to inform future changes to guidelines on osteoarthritis management. Although clinical guidelines for managing lower limb osteoarthritis (LLOA) in the primary care setting were proposed in Hong Kong in 2004,7 comparison with recently updated international guidelines shows some differences from management in Hong Kong. Treatment of KOA can be divided into non-surgical or surgical treatment. Non-surgical treatment comprises non-pharmacological and pharmacological treatment, and non-pharmacological treatment comprises core first-line treatment for all patients with OA, including education, self-management, exercise, and weight reduction. Other primary non-pharmacological treatments for KOA include walking canes and biomechanical interventions like braces and orthosis. Pharmacological therapy may include the use of paracetamol, topical or oral non-steroidal anti-inflammatory drugs (NSAIDs), or intra-articular corticosteroids. Surgical procedures are a last resort for end-stage KOA, the most effective type of which is total knee arthroplasty with rehabilitation (Fig). Both the Hong Kong LLOA and OARSI guidelines aim to teach patients more about OA; provide them with information about the disease process, nature, prognosis, investigation, and treatment options for OA; facilitate changes in health behaviour; and improve compliance with doctor advice. Counselling can take the form of telephone-based or group sessions or spouse-assisted training programmes, and this counselling works in combination with other treatment approaches. Exercise aims to reduce pain and improve general mobility and joint function; more intensive exercise can strengthen the muscle around the knee joint. Exercise is one form of first-line treatment advocated by the Hong Kong LLOA guidelines. There is no recommendation regarding the type of exercise to do, suggesting that it has lower efficacy in reduction of pain and disability compared with weight loss. Exercise is now universally recommended by the other international guidelines. Recent studies suggest the important role of exercise in OA management, and different types of exercise have different benefits in KOA treatment. Targeted strengthening exercises, aerobic exercise, stretching, and flexibility exercises are recommended by AAOS, ACR, and OARSI. A study in 2016 found that water-based exercise has short-term benefits for function but minor benefits for pain.15 It is suggested for patients with functional or mobility limitations. Biomechanical intervention and walking canes are not included in the Hong Kong LLOA guidelines but are regarded as appropriate and effective by the OARSI guidelines. A literature review suggests that knee braces and foot orthoses could have a positive impact on decreasing pain and stiffness and improving physical function. However, conclusions about their effectiveness have yet to be made because of the lack of clinical trials and the heterogeneity of interventions among the studies reviewed.17 Both the OARSI and ACR guidelines suggest that walking canes are appropriate for KOA but not appropriate for multi-joint OA because they may increase weight loading on other affected joints.18 In contrast, the AAOS guidelines are inconclusive about this topic. The Hong Kong LLOA, ACR, and OARSI guidelines recommend that steroids only be used in acute exacerbations of joint inflammation, as frequent use can result in cartilage or joint damage and increase infection risk. The AAOS recommendation on this topic is inconclusive. In Hong Kong, opioid analgesics are considered if paracetamol is inadequate and NSAIDs are contraindicated, ineffective, or poorly tolerated. The ACR also suggested that opioids may be an alternative in failed initial therapy. However, with reference to international guidelines for OA management, we should consider the long-term overall usefulness of opioids. Although they have benefits for pain and physical function, compared with those who are not, patients taking opioids have a chance of adverse withdrawal effects that is 4 times higher, and a risk of developing serious side events, including fractures and cardiovascular events, that is 3 times higher.25 International guidelines provide a similar recommendation, AAOS makes an inconclusive recommendation, and OARSI is uncertain about opioid use because of the increased risk of side-effects. As mentioned above, an increasing number of studies has proven the effectiveness of exercise and physiotherapy on OA management; with the increasing ageing of the population, it would be ideal for Hong Kong to develop a well-established exercise programme for patients with OA as both a non-surgical treatment and follow-up. There have already been different well-established exercise programmes for non-surgical OA management throughout the world, and they have achieved great outcomes. Successful examples include the Osteoarthritis Chronic Care Program in Australia (OACCP),28 Better management of patients with OsteoArthritis in Sweden,29 and Good Life with osteoArthritis in Denmark (Table 2).30 All of these programmes have been proven to improve patients’ pain, mobility, physical function, and quality of life. The OACCP has also proven that an exercise programme helps to decrease the demand for arthroplasty; 11% of knee and 4% of hip OA participants who had been waiting for arthroplasty agreed they no longer needed surgery. Different programmes may have minor arrangements targeting their patients, but their content and training duration are generally similar; these programmes consist of education delivered by physiotherapists and sharing from “expert” patients, supported self-management, and supervised neuromuscular exercise sessions of progressive intensity. These programmes usually last at least 3 months with follow-up for 12 months. 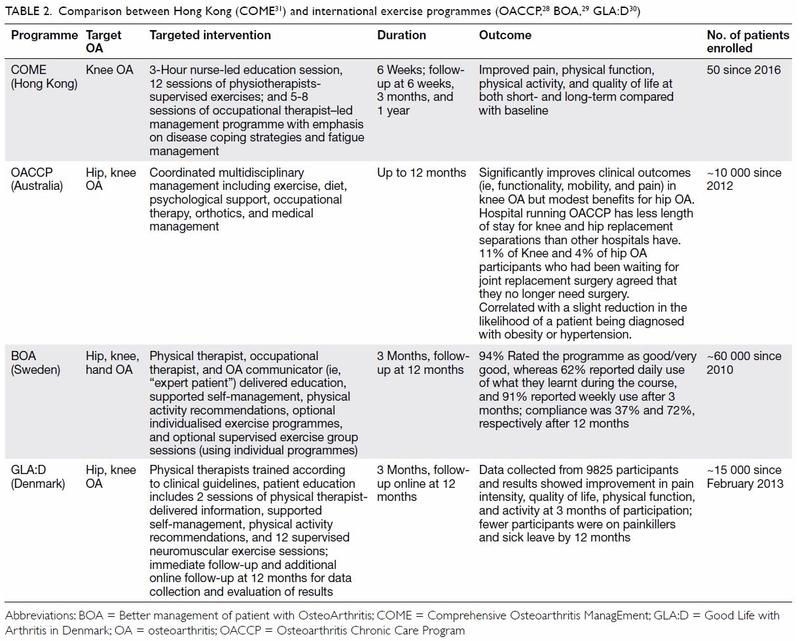 Comprehensive Osteoarthritis ManagEment (COME) initiated in 2016 is a pioneering programme for Hong Kong.31 The COME programme is a multidisciplinary exercise programme for non-surgical KOA that consists of a 6-week intensive training programme: the components include a 3-hour nurse-led education session, 12 sessions of physiotherapist-supervised exercises; and five to eight sessions of an occupational therapist–led management programme with emphasis on disease coping strategies and fatigue management. After 1 year, patients enrolled in the COME programme reported short-term improvement in Pain Self-Efficacy Questionnaire, Functional Assessment of Chronic Illness Therapy–Fatigue Scale, physical capacity assessed by quadriceps strength, and physical function assessed by one-minute chair test. 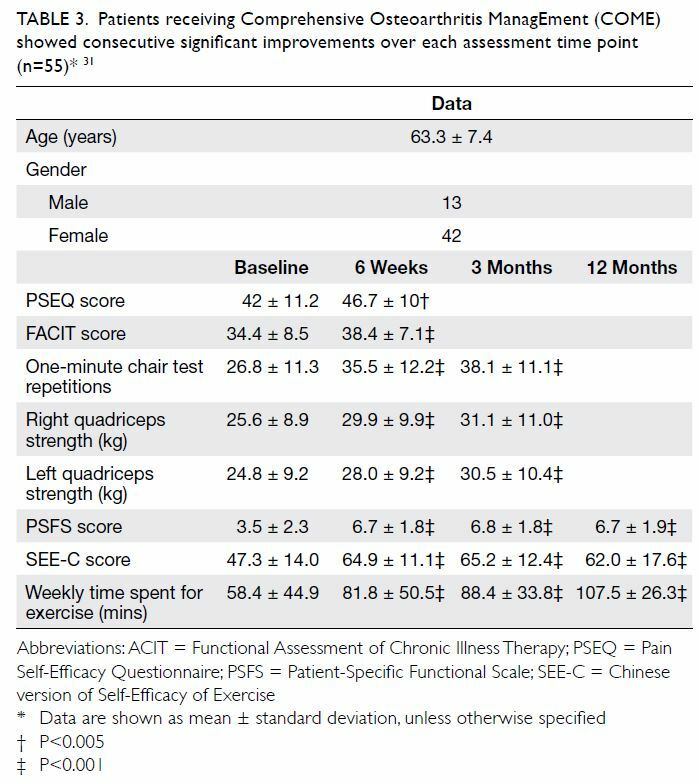 One-year improvement showed in Patient-Specific Functional Scale, Chinese version of Self-Efficacy of Exercise, and weekly time spent for exercise (Table 3). In ageing populations, the prevalence of KOA is expected to increase; thus, there is a need for consensus on non-surgical OA management, so as to improve outcomes for patients with OA and to decrease the burden of arthroplasty. Various exercise programmes for non-surgical OA management have been shown to be effective for improvement of pain, physical function, mobility, and quality of life, and these programmes have even decreased the need and waiting times for arthroplasty. Long-term follow-up of such exercise programmes should be considered to further assess their outcomes. Concept or design: RHS Kan, PK Chan, KY Chiu, CH Yan. Acquisition of data: T Ho. Analysis or interpretation of data: SS Yeung, YL Ng, KW Shiu. Drafting of the manuscript: RHS Kan.
Critical revision for important intellectual content: RHS Kan, PK Chan, KY Chiu, CH Yan, T Ho. 5. The Chinese University of Hong Kong. Osteoarthritis in Hong Kong Chinese—prevalence, aetiology and prevention. 2001. Available from: http://www.cuhk.edu.hk/ipro/010306e.htm. Accessed 14 Dec 2018. 6. Census and Statistics Department, Hong Kong SAR Government. Hong Kong population projections for 2017-2066. Available from: https://www.censtatd.gov.hk/media_workers_corner/pc_rm/hkpp2017_2066/index.jsp. Accessed 14 Dec 2018. 7. Department of Community and Family Medicine, Chinese University of Hong Kong; Centre for Health Education and Health Promotion. 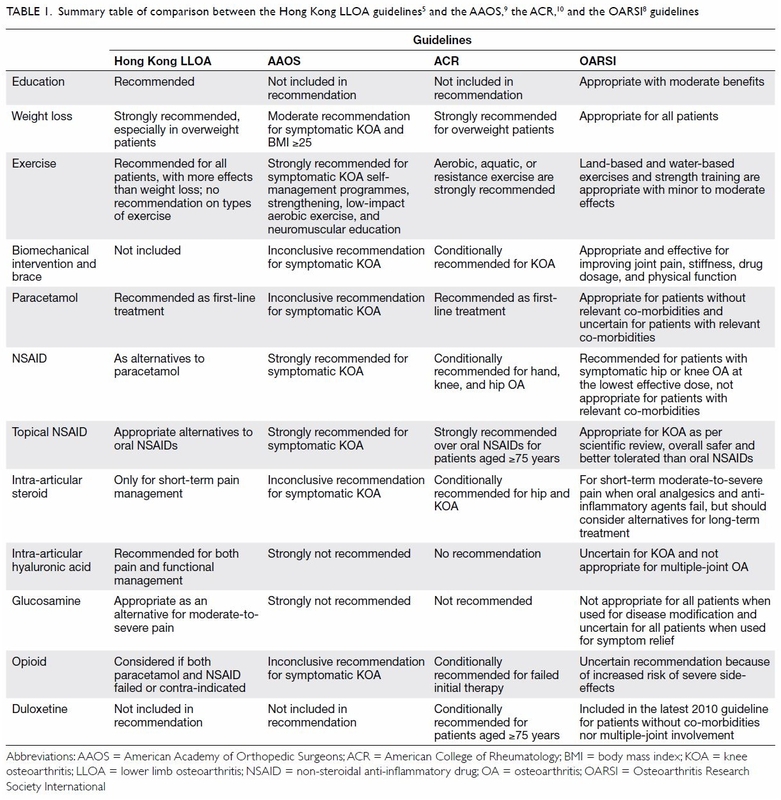 Clinical guidelines for managing lower-limb osteoarthritis in Hong Kong primary care setting. Department of Community and Family Medicine, Chinese University of Hong Kong; 2004. 22. Chou R, Helfand M, Peterson K, Dana T, Roberts C. Comparative effectiveness and safety of analgesics for osteoarthritis. Rockville, MD: Agency for Healthcare Research and Quality (US); 2006. 28. Deloitte Access Economics. Osteoarthritis Chronic Care Program evaluation. Agency for Clinical Innovation. 2014. Available from: https://www.aci.health.nsw.gov.au/__data/assets/pdf_file/0009/259794/oaccp-evaluation-feb-2015.pdf. Accessed 15 Dec 2018. 31. 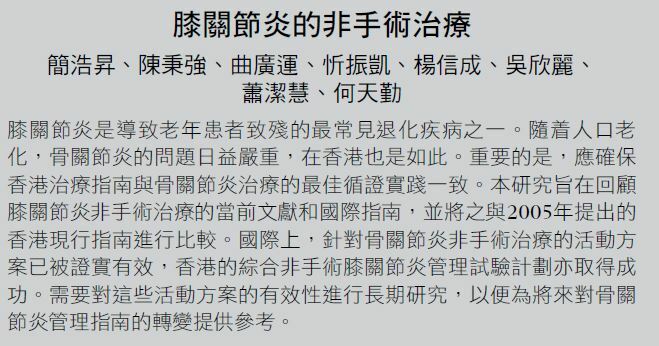 Chan PK, Yeung SS, Siu SW, et al. 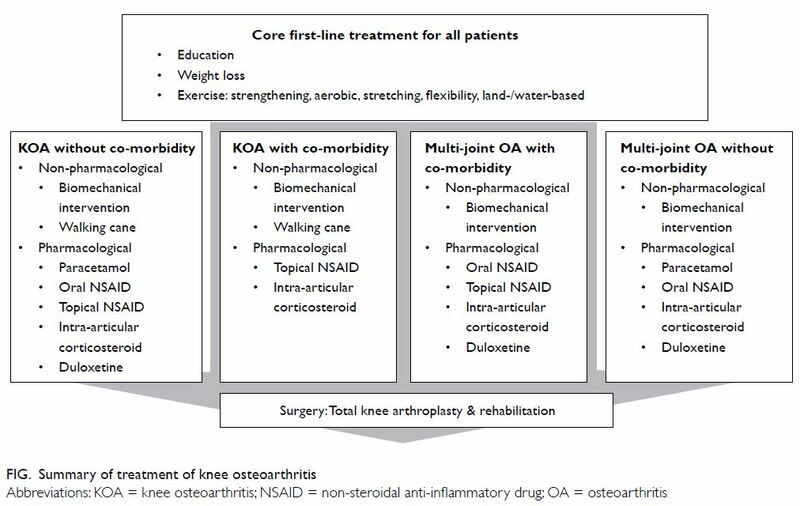 Comprehensive Osteoarthritis Management (COME) Programme—Multidisciplinary exercise training programme for patients with age-related osteoarthritis of knee. Hong Kong. Proceedings of the 13th International Symposium on Healthy Aging “Aging, Health, Happiness”; 2018 Mar 10-11; Hong Kong. Hong Kong: LKS Faculty of Medicine, The University of Hong Kong; 2018: 70.